Welcome to my new webpage. This is a long overdue revamp of my site, which had not been updated for years. Thank you for your patience. Well much has happened since I launched my webpage years ago. 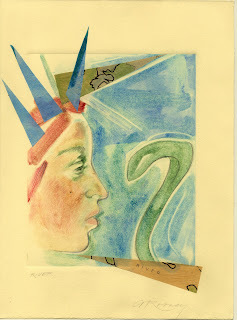 My work has travelled from OZ, to Turtles and now back to the Statue of Liberty. Presently, I'm working at both monoprinting and oil painting on wood. 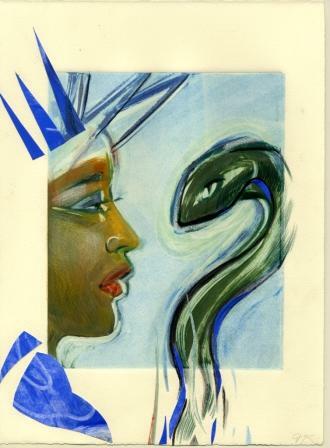 It feels so good to be back in my Berkshire studio reworking older work from OZ from Toto's Point of View Series and just exploring the Statue of Liberty confronting a snake, which is a wonderful metaphor the state our country is in. It seems of late, I'm drawn to images of women/girls. The Statue of Liberty represents all that's good about America. My country, which I love dearly seems to be fading from view and thus Liberty is sinking beyond the horizon. See banner image, Disappearing Liberties.